The Majestic Theatre strives to make its theatrical performances and facilities accessible to all our patrons. For further information on any of the above services or additional accessibility questions, please contact the Guest Services Office at 210.226.3333. 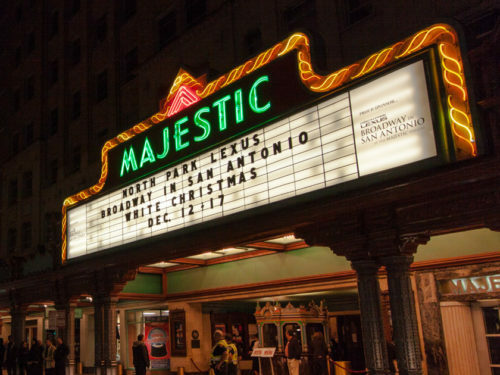 Today, the Majestic Theatre is San Antonio’s premier performing arts facility featuring Broadway shows, concerts, comedians, and other live events! There is a drop-off zone located in front of the theatre on Houston Street. Accessible Seating for wheelchair needs are available for purchase online, by phone, or at the Majestic Theatre Box Office. To purchase online please visit www.Ticketmaster.com or www.BroadwayInSanAntonio.com. To purchase over the phone please call Ticketmaster at 1.800.745.3000. If you need assistance in the theatre, please find the closest usher or see someone at the Box Office. Audio Description brings the theatrical experience to those who are blind or have low vision. Using a single earpiece connected to a radio frequency headset, patrons can listen to a trained audio describer narrate the visual elements of the performance. Live Audio Description is available upon request for the season. These requests are subject to the availability of an interpreter and are provided at the discretion of management. Patrons should call the Box Office at 210.226.5700 at least two weeks prior to a performance. American Sign Language interpreted performances are provided upon request for patrons who are deaf or hard of hearing. These requests are subject to the availability of an interpreter and are provided at the discretion of management. Patrons should call the Box Office at 210.226.5700 at least two weeks before a designated performance to make arrangements. Open Captioning is a text display located close to the stage that scrolls words in synchronization with the performance. Open captioning performances are scheduled for the below indicated dates and times, which are generally on the Sunday Matinee performances. The nearest parking garage is the Mid-City/Houston Street Parking Garage located on the corner of College Street and Navarro, across from La Mansion Hotel. Visit here for more Downtown Parking Facilities. ParkWhiz is the fastest and most convenient way to find and book a parking space before reaching your destination. ParkWhiz allows you to find, reserve, and pay for parking anywhere you go, anytime you need—whether you’re headed to work, an event, or just out on the town. You’ll know exactly where you’re going and how much you’re paying ahead of time, so you won’t have to worry about it. View real-time availability and pricing near the Majestic Theatre.